1. Born in Staunton, Virginia, in 1856, Thomas Woodrow Wilson was a child during the Civil War. His father's parents had lived in Ohio and his grandfather had published an anti-slavery newspaper, but his father, a prominent presbyterian minister, had taken his family to Virginia in the early 1850's, owned slaves, and supported the Confederacy during the war. Wilson grew up in Augusta, Georgia, where his father served as the minister of the First Presbyterian Church. 2. Though he was largely home-taught, and struggled learning to read as a child, possibly due to dyslexia, Wilson was a good student and eventually attended Princeton. He later studied law at University of Virginia and though he did not graduate, he later passed the bar and briefly worked as a lawyer in Georgia. In 1883, he began attending Johns Hopkins University, where he earned a Ph.D. in history and political science. 3. While attending graduate school, Wilson married Ellen Axson and together they had three daughters. Shortly after their marriage, Wilson finished his studies and began teaching at Bryn-Mawr College. 4. In 1890, Wilson began teaching law and political science at Princeton and quickly gained prominence, becoming president of the university in 1902. He held this position until 1910, at which point he decided to leave academia and enter politics. 5. Elected governor of New Jersey in 1910, Wilson quickly gained national prominence and decided to run for president in 1912. After a heated Democratic National Convention, Wilson won the nomination on the 46th ballot, outmaneuvering Speaker of the House Champ Clark of Missouri. In the general election, Wilson benefited from a split in the Republican party and won the White House with just 42% of the popular vote, but a landslide in electoral votes. 6. Wilson was one of only two Democrats who served as president between 1861 and 1933, and was the first Southerner in the White House since Andrew Johnson left office in 1869. 7. In 1914, Wilson's wife died, making him only the third (and, to date, last) president to be widowed while in office (John Tyler and Benjamin Harrison were the others). Wilson remarried the following year to a local widow named Edith Galt. 8. In 1915, Wilson became the first president to attend a World Series game, throwing out the first pitch of Game 2 between the Boston Red Sox and Philadelphia Phillies. 9. Narrowly winning reelection in 1916 against a progressive Republican, Wilson led the United States into World War One the following year. Much of his second term was spent fighting with Congress for ratification of the Treaty of Versailles and America's entry into the League of Nations. Wilson had been one of the founders of the League of Nations, but Congressional Republicans blocked America's entry into the League because they feared it limited America's power to declare war independently. 10. 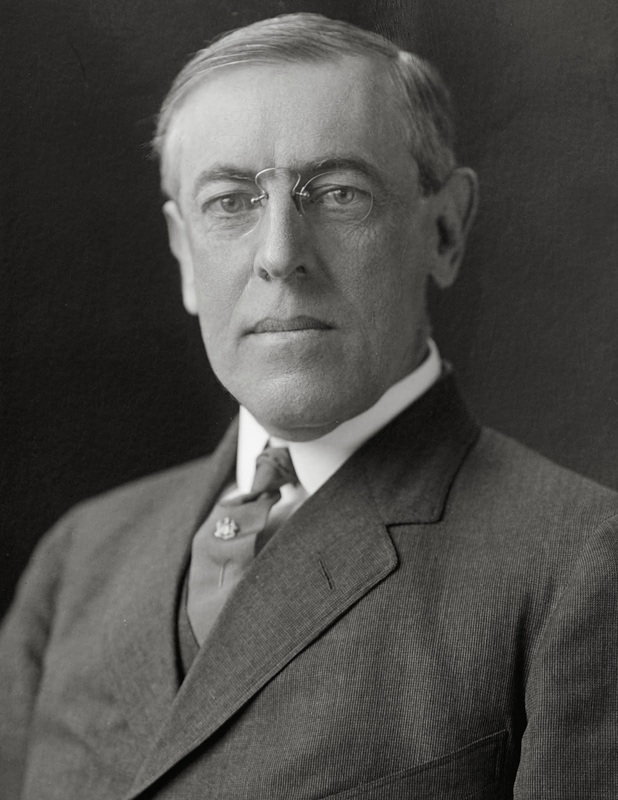 The fight over the League of Nations took its toll on Wilson's health, and for the last two years of his term, he was disabled by a series of strokes. As there was, at that time, no clear constitutional precedent for what to do if a president became unable to perform his duties, Wilson's wife effectively led in his place. The 25th amendment, adopted in 1967, finally addressed this issue directly. Wilson died in 1924.